I have a blog called Toasted Bread. 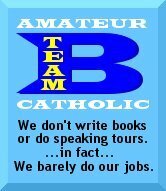 Would you consider joining me to your blogroll "Amateur Catholic"? Too bad the Generalissimo is still dead, huh? Welcome to the B-Team! Well, I know you have written "Too bad the Generalissimo is still dead" as a joke. I would not like to think it otherwise. But for me this is NOT a joke. He was not only a dictator -with all that that implies: massive killings, human rights violations, etc- but he imposed himself a certain state of affairs in his relationship with the Church that has damaged it throughout all these years. His view has also damaged the right-wing moderate parties, more supportive of the Catholic Church views, that are just everyday hearing "jokes" as the one you have just written. So if you can just erase that kind of "joke", I would be very grateful. Tongue in cheek, yes. But not really a joke. I know you have much more knowledge of the realities of what life would like be under him and I certainly wouldn't trade the blessing that I have of being born in the USA (inspite of our own problems). Theoretically, I would have rather seen Franco been more true to the Carlists. But the reality is that you can't judge a leader just by an ideal, you have to consider their circumstances. Now, looking back to the time of the revolution, which of the opposing political forces were "good"? Which one respected the dignity of the individual and was supportive of the Church? Answer: None. They were all sheer evil and enemies of the Church. It would be unjust to judge Franco (or any leader) based merely on an ideal. You must consider the circumstances in which we find them. At what point after the war could Franco have turned over the government to the monarchy or a republic? Certainly not within the first 20-30 years. That government would have ended as quickly as it had begun, and after a violent aftermath you would be faced with a tyrannical regime of another stripe. Also consider what would happen to Franco after he abdicated. How long do you think he would have lasted without the full protection of the state? I'd give him less than a year. Unfortunately, Spain was (and still is) far from united in purpose and loyalty to her heritage as one of the finest elements of Christendom. Because of that I believe that post-war Spain was destined to have an autocratic regime of some sort, the question was which one. She got the best one, one in which the dictator would provide for a new and freer government upon his death rather than perpetuate it, whether it continue by "party" rule or appointing his child or friend as successor. So, in closing, while I wouldn't necessarily want to live under the Franco regime, I would gladly pick that over any of the other factions in play in Spain during those years. I can't say with 100% surety, but based on what I know, I don't think a free republic was a workable option for Spain. And frankly, I fear for you guys still. I think your country is rushing headlong down the drain as we speak (not that ours isn't, but look how far Spain has fallen just in the last year). Anyway, sorry to have offended or upset you. It certainly wasn't my intention. I am amazed at foreigners, really. Carrillo, Communist, assasinated in cold blood a lot of my own family, so you I really do not need any lectures about the Republic. Yes, it was a bad regime. Yes, it was anything to do with real democracy. And, yet, foreigners are VERY responsible of Franco's dictatorship. Instead of denouncing what was going on in the Republic, they never did it. They thought Spain was fit for a modern Republic. And it was not. Now? Well, nowadays we are living 2nd Republic remixed, with King Juan Carlos being a "very Republican King", as @#€|@ Zapatero has said. The Parliament approved yesterday calling 2006 the "year of the Historical Memory", that is, hmmm, the remembrance of the Republic once again. And I do not judge Franco on an ideal. As any dictator he committed crimes and unjustices. Would have communists commited them? YES. I cannot deny that. But I should say the result would have been the opposite, with a left-wing parties discredited. And that would have been very good to Spain in general. Now they are once and again telling about their legitimacy is because they fought against Franco.... when the majority of them were very peaceful at that time or worked for the dictatorship. And sorry for my outburst. But really this time is very difficult from us in all senses. Looks like Zapatero is going to announce the beginning of the conversations with ETA this same week. And international news keep telling that people who are not for that kind of dialogue -me for instance- are just vengeful monsters. Yes, but I would go a step further and say that many western nations (the United States government incuded) weren't necessarily of the mindset that "Spain was fit for a modern republic", but were essentially (as they are to this day) indifferent to Spain altogether, and more, not necessarily disagreeable to communism/socialism (certainly FDR could not be viewed as an enemy of socialism at home or abroad). Again, I wasn't there, and haven't done exhaustive research on your history, but honestly, I don't see how there was any possibility for a free government in the aftermath of the war. It seems a hard argument to make that a re-established monarchy would have been strong enough to rule, let alone do so while allowing much personal freedom. Absent a certain measure of national unity, the only workable government is going to be autocratic. I'm afraid that is the situation Spain was in. I think it much better to have a Franco than a Stalin. Would have communists commited them? YES. I cannot deny that. But I should say the result would have been the opposite, with a left-wing parties discredited. And that would have been very good to Spain in general. Lady V., but that is an illegitimate thought. You are assuming that if the communists had won that you would be in the position you are in now and there legitimacy could be evaluated. In all likelihood, if they had won the Church would be essentially non-existant or deeply underground. Perhaps your parents would have suffered the same fate as your grandparents and you never even born. If the communists were to not be in power to this day, it would have surely taken another bloody civil war to have ended their rule. Then what? Most likely another dictatorship. I don't agrue that there was no injustice under Franco, but I given the reality of the matter I don't see anything better that could reasonably happened. In the end, Spain got her chance to have genuine freedom because of Franco, and in the 30 short years since his death is on the brink of losing any semblance of it. It's sad, and as someone who holds Spain's role in Christendom in high esteem, I feel for you and your countrymen. I'm afraid things are going to get much worse before they get better. My prayers are with you. pardon the numerous typos... there = their, etc. doh! To 1st, yes. That is true. If we are doing this now, imagine 70 years ago. Yet, I do not like Franco not Stalin, although the latter was the worst, with Pol Pot I think. So the comparison is not very good. About 2nd: pardon, but that is not illegitimate. It is REALITY. I am not assuming I would have been born -90% probability it would have been impossible-, I am only saying that the total situation would different. Yes, the Church would have been persecuted. Yes, my family would have made their way in other countries -if they would have been able-... etc. But it would have been a very similar situation to Polish one. And look, Poland is now very supportive of Catholicism. Anyway, those are hipothetics that are no more than "what would have happened if...". From my point of view, Franco did not solve the problems, only made them appear a little later. Indeed, you need miracle. One of the fascinating things about Spain's history is how God provided miracles when the people stood up for the faith. It took 700 years of on and off fighting coupled with some big time miracles for Spain to get rid of the Islamic menace, but it did happen. Admirably they managed in spite of the general indiffernce of the rest of Christendom. Spain is indeed a special place in my eyes. I know you disagree, but given the forces in play during the war years, I would consider the victory of Franco and his allies one of those miracles. Perhaps too one could be grateful for Franco that Spain was spared WWII. Had the communists won, they would most likely have entered the war...indeed, they probably wouldn't have had a choice because as you know, Moscow pretty much would have been calling the shots. Anyway, thanks for the exchange. I love history and I enjoy contemplating its meaning. You're welcome ;). I also love history. And well, Franco's victory was the less bad thing but that does not mean it was the most favourable thing. :( And it's probable that Spain would have joined the WWII but Spain is not very near Russia and I think the grasp would not have been so tight as in the Eastern Countries. Anyway, we are back in the 1936 -as some leftists MPs said in Parliament-, although they have not beginning killing people. But what they are doing now is more subtle, but equally bad. Ahh, but consider this government's policies toward the unborn and the family. Indeed the killing has begun. Our country sanctions the murder of 1,000,000 souls a year by abortion alone. I doubt one could begin to count the number destroyed by "fertility" treatment, etc. It's easy for some to dismiss those without voices, but it always starts with those poor souls yet never ends with them. At least the majority of Franco's "victims", if you wish to call them that, were people who acted upon their own will and were enemies not just of Franco and his regime, but of the Spanish people as a whole. Those "enemies" would have brought upon you something much worse. Brace yourself, dear. It's going to get much uglier there before it gets better.